This is a more of a lookout then a hike, a gimme view from the car. Great for those with small children who don't want to overdo it. Nonetheless, Ualaka'a Lookout provides a fantastic view of Waikiki and Diamond Head. There are a few trails at the park your family can hike with wild chickens, mongooses, and cats roaming around. Check out our experience at Pu'u Ualaka'a State Park. Located in Kailua near Lanikai Beach, Lanikai Pillboxes is nicknamed for the 2 WWII bunkers at the top of the hike that resemble pillboxes. 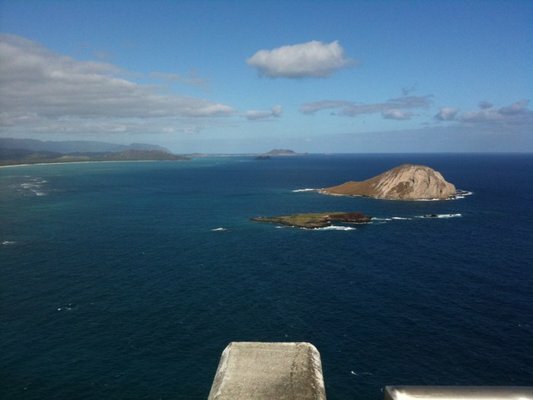 This hike is short and should take the average family around 30 minutes to reach the top of the pillbox for an unforgettable view of the Mokulua islands. Use a hiking carrier for the small keikis like the ones mentioned in the Recommended Gear Tab at the top of this page. 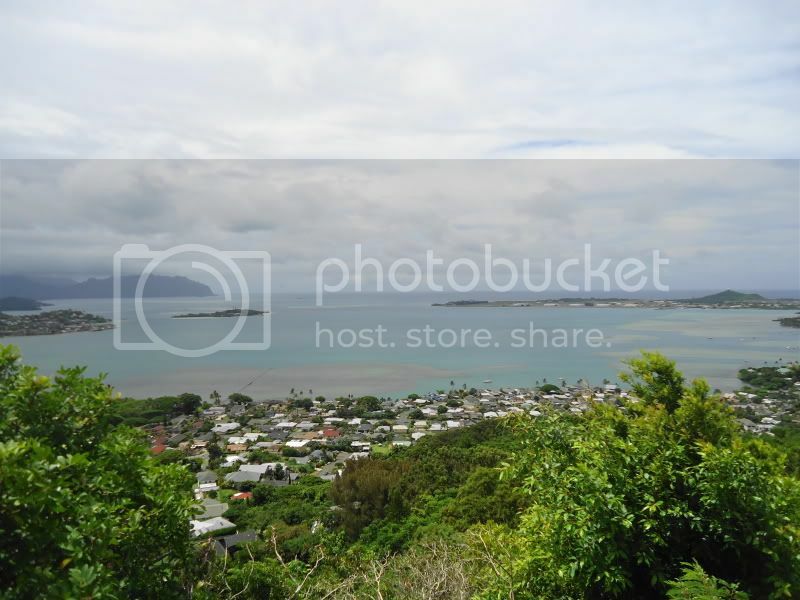 For more info visit our post on Lanikai Pillboxes. This hike is recommended with bigger kids that are able to climb a massive amount of steps and withstand the heat of Summer. For the little ones, I recommend a baby carrier and a physically fit parent that is determined. The reward is a view of Honolulu that no one in the family will forget. Here was our experience with Diamond Head Hike. 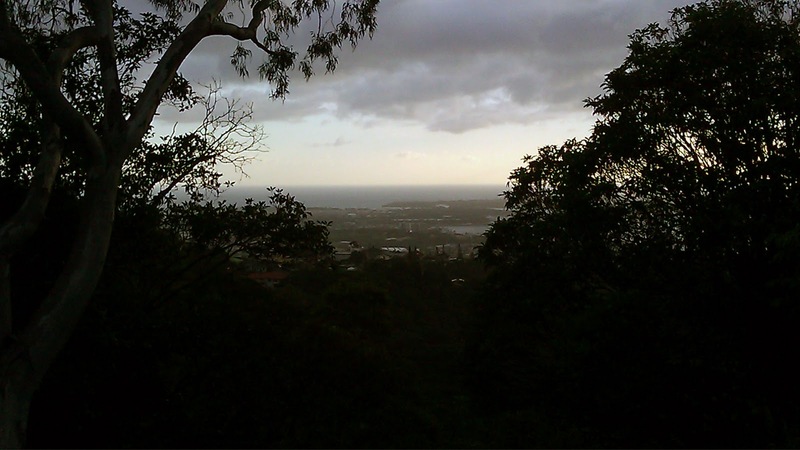 Pali lookout has a paved trail called Old Pali Road that is accessible with a stroller. It is a nice trail although some parts toward the end seem to be swallowed by the jungle. Lush greenery, cool winds, and amazing views will provide an unforgettable experience by all. For our detailed family experience with Pali Road Hike click here. Another great exercise trail with a view. The trail is paved for use of strollers and transverses up to a hot ticket whale watching spot when they migrate in the winter. Be sure to stop by the tidal pools on your way back down to cool off with the kids. Need a more detailed account? See how much fun our family had at the Makapu'u Light House Road hike here. Manoa Falls is a must family friendly hike to see a waterfall in Oahu. The trail is not paved, but has plenty of rocks and roots for footing. It won't be possible to bring your stroller on this hike. If you have a small child I recommend a hiking carrier for the best family experience. Check out our post on Manoa Falls to see what to expect and plan ahead. Mariner's Ridge is a lovely hike through the forest that leads to a breathtaking view of the surrounding mountain ranges with the Pacific Ocean as a backdrop. This Hike is considered beginner/intermediate, but will give anyone in the family a decent challenge. The path is not paved, so bring your Hiking carrier if you have small children and the whole family will have fun. For more travel intel so your family can plan ahead see our post on Mariner's Ridge Hike. The Aiea Loop Trail is located in the Keaiwa Heiau State Park and is great place to camp or spend the day with the family. This 4.8 mile trail runs along the ridge on the west side of Halawa Valley and offers stunning views from Pearl Harbor and the Wai'anae Range to Honolulu and Diamond Head . This hike is considered intermediate and requires some preparation, so be sure to check out my post on Keaiwa Heiau State Park before you go. Located in Kane'ohe, the Friendship Garden is known for its one kilometer (0.6 miles) of non-strenuous hiking trails that take visitors through groves of macadamia, banyan, mahogany, strawberry guava and eucalyptus trees in a peaceful setting. Friendship Gardens is perfect for familes looking for solitude, nature, and great views of windward Oahu. For more info check out our day at Friendship Garden here. If you are interested in taking the family on a guided hike with a tour guide and transportation click on the photo above. Thank you so much for posting all of this! We are new to the island and I am really appreciating all of this info. I didn't happen to see one of my favorite hikes on your list. Lulumahu Falls is an awesome, easy and lots of fun hike I like to do with my fiancé and daughter. Beautiful scenery that will make sure that you remember it.